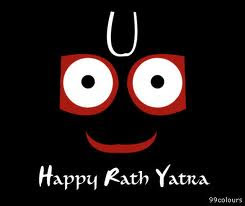 Lord Jagannath, the symbol of universal love and brotherhood is worshipped in the ‘Shree Jagannath Temple’ along with Balabhadra, Subhadra, Sudarshan, Madhaba, Sridevi and Bhudevi on the RATNAVEDI . 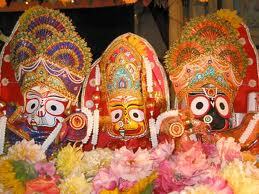 Lord Balabhadra is the elder brother, Lord Jagannath is younger brother and Devi Subhadra is youngest sister. The Deities of Lord Jagannath, Balabhadra, Subhadra and Chakra Sudarshan are made of margosa wood. The tree worship is a very ancient cult. 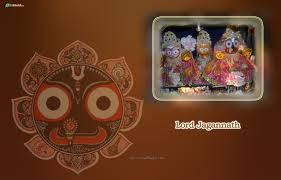 However the most accepted and popular theory over origin of Jagannath relates to ‘SAVARS’ or aboriginal traditions. The word wood 'DARU' is used to indicate material of which the universe is made. Jagannath is specifically known as Darubrahma both in Puranas as well as by the people. The image of Jagannath Subhadra (the creative energy) and Balabhadra ( of white colour representing phenomenol universe) have evolved from Nilamadhava of the ancient Kalinga Jaina. According to him 'Sudershana' is the Hindu name of the Dharmachakra of Jaina symbol and the term Kaivalya (liberation) exclusively common in the cult of Jagannath is derived from Jaina tradition. 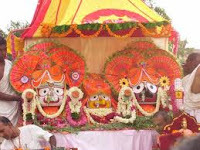 Jagannath is regarded as Daru Brahma, i.e. the Godhead manifestation in a modern image. The worship of Daru Brahma is traced to Vedic sources and to Bhagbat Gita.